Make sure you use a Digital voltmeter on a low setting (like 2 volts). Attach black lead from voltmeter to engine ground. Allow red lead from voltmeter to contact coolant. Do you have a reading? Now, remove your battery terminals (at your battery) and repeat the the test. Still have a reading? If your voltage dropped with battery disconnected, you have TYPE A, if voltage remained, you have TYPE B. 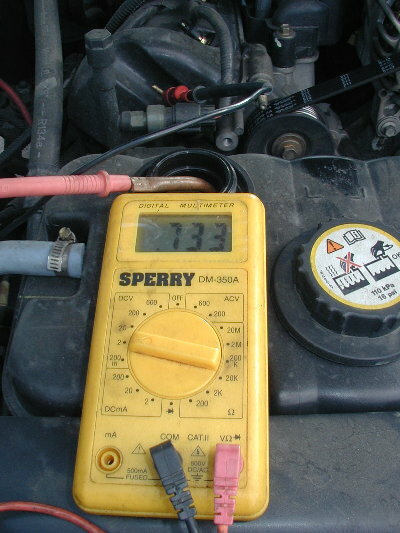 "Simply attach the negative lead of the voltmeter to a good grounding point on the engine, and dip the positive lead into the coolant..."
Can Electrolysis be measured? At the heart of any electrolysis discussion is it's measurement. If it can be measured, it's presence can be verified, which is extremely important when we are classifying, treating, and removing the electrolysis. Simply attach the negative lead from your DVOM to the engine block or other known good grounding point. With the red positive lead, dip it into the coolant. Ensure that your DVOM is on the 2 volt scale. If you measured zero or near zero, congratulations! You don't have electrolysis. If you measured less than .1V, your cooling system should be below the activity threshold, no action required. However, if you measured .3V or above, then keep reading because we have one more test to complete. Disconnect your battery terminal and re-measure as you did in step number 1.